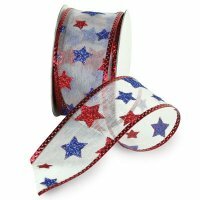 Bursting with excitement Starburst Patriotic Ribbon is ideal for any celebration! Bold red and blue glitter stars dance along a white sheer fabric edged with red foil. Use our Patriotic Ribbon to decorate wreaths, to create crafts & bows, or as a festive accessory to your floral display & gift packaging.